As ladies, we all have an addiction when it comes to shopping; whether clothes, shoes or make up. One minute you are in a matatu at Ngara and you see clothes vendors selling clothes for as little as 50 Kshs and you can't help but alight. Before you realize it, you are going home with a new pair of jeans, a chiffon blouse and shoes. Another day you are on Instagram scrolling through pics and you come across this page that is selling heels for 2500 Kshs ; a pair you saw at another shop for double the price and you immediately get yourself a pair; after all they are half the price. Another day you see your friend with this awesome Ankara skirt and you ask her where she got it from and she tells you her tailor made it for her and within a week you are rocking a similar one. I am a victim and I have been caught up in such situations a number of times but hey!I am slowly coming out of it and am proud to say that I can go for a whole month without shopping aimlessly for lack of a better word. So ladies I wanna share a few tips on how to shop on a budget so you don't end up fasting because you used all your lunch money to buy a pair of Louboutin heels. I know thrifting is quite the addiction especially because of the low bargains but it doesn't mean that when I visit Gikomba and come across a dress for 100 Kshs that I should buy 6 just because its cheap. No! The first thing you should ask yourself is whether you really need those 6 dresses? Furthermore, most of us end up buying so many clothes yet at the end of the day we don't put them on. What you actually get from having too many is hours of frustration looking for the perfect dress. So ladies even if its as low as 50 Kshs, buy it because you need it. For the few months I've been a fashion blogger, one thing I've learnt when it comes to shopping is to stick to the staples. Trends are a no go zone for me...Why? At the end of the day what's trendy will eventually stop being trendy then what? It becomes outdated and you won't put it on again. So ladies, invest in a timeless piece and believe me you will never be caught in a situation where you don't have something to wear just because what you have is not for that particular occasion. By timeless pieces here I mean the LBD, a fitting blazer, a white tee, blue/black denim, a pencil skirt, classic pumps etc. You can create so many outfit combinations by just having these staples. Say if I had blue jeans and a white tee, I would wear it as casual wear then turn it into formal by throwing in a black blazer, classic black pumps and a handbag and perhaps tuck in the white tee and voila! It is interesting that many of us actually wait for the rainy season to buy trench coats, heavy sweaters and boots.What you don't realize is that during such seasons, prices of such clothing become so expensive. You get a trench coat for as high as 1500 yet if bought during the hot season you would otherwise get 5 for the same price. Interesting, isn't it? So ladies, shop out of season because that way you get away with huge discounts. Who doesn't love a bargain after all? 4. Speaking of discounts, if at any given point you hear your favorite store is having a 50% off sale, go for it. If need be, subscribe to your favorite online stores so you get alerts when the sales are on. Just 2 weeks ago, Maybelline were having a 50% off sale on their makeup products and I managed to get something for myself. And last week, a site called Tiqueabouclothing were also having a 50% off sale on all their clothing. You should check them out..they got awesome stuff. Yet still JUMIA has been having this 30% off beauty sale on some of their products. Ladies take advantage of these sales! 5. If you are the kind to keep your money till mid month then believe you me this is the best time to shop. When it gets to mid month, a number of people are normally broke and would rather spend their money in better ways than shopping. So if you are the saving type, this is the best time to go shopping. This is the time ladies to exercise your bargaining skills and bargain from as much as 1500 Kshs to 500 Kshs. Most shopping places actually lack customers during this time as opposed to end month when they are up to the rafters because apparently everyone has been paid. Ladies its time you shopped smart. Don't get yourself into huge debts as a result of not budgeting. Lol! Everything you have said about being a spendthrift and a shopaholic actually relates to me because I tend to suffer from that, however I am very thankful for the redemption which you've given inform of shopping advice. Thanks alot dear. I once bought my only pair of Louboutins at sh400(on sale) in Paris and I didn't eat out or buy lunch for 1 year, daammn, those shoes are really expensive. Yes yes yes! great tips! Linda!!! Stop making me feel guilty lol. 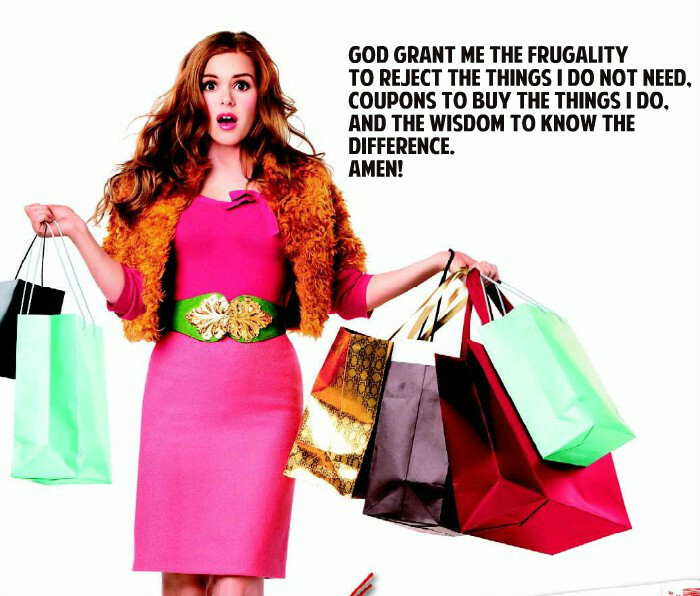 Even though I know the importance of shopping on a budget and even put up a post on it on my blog, I'm still struggling. It's kinda hard uno, esp with this 'vintage era' where the pieces are quite cheap it's so easy to buy so many and realise you've spent quite a lot. Great read dear , these are very good tips ..Thank you for sharing and keep up the lovely posts. Graet tips Linda especially number 2 and number 6!! Loved this post. Thanks dear:-) Glad you liked it! i used to do that alot ( dont know whether its an age thing or what )and then later complain i dont have anything to wear yet the closet is full. i could even buy clothes a size smaller in the how that i will loose weight some day and wear it. i decided to declutter and since then i only buy what i need and can wear. very good tips..thanks for sharing.